Did Sony China just tease & delete a new Xperia device render? Smartphone manufacturers are well known for taking to Twitter and other social media to tease upcoming devices, but rarely do we get as meaty leaks as the one that Sony's Chinese arm allegedly posted a few hours ago on its Weibo feed. The post, since removed, shows a render of a mysterious device from all sides. Since we were a little late to the party, it is now impossible to verify if that post, indeed, existed, but several sources in China seem to think so. If true, this would rank as a monumental misstep on the part of Sony China's PR people, or just some weird stunt. The render itself shows us a seemingly thin device with a metal frame encasing it. The top and bottom bezels are nearly non-existent, with the latter housing a circular, Meizu MX4-like home button (we suspect). As you can see for yourself, the renders are kind of crude, and remind more of a concept than something that can actually be engineered at this point in time. 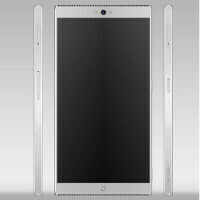 Obviously, it's tempting to suggest that this could be a very early look at what the upcoming Sony Xperia Z4 will look like, though we wouldn't bet our lunch money on it. If the Xperia Z3 is any indication, Sony is moving to rounder aesthetics for its phones, and the device seen here reminds us a lot more of the company's previous efforts. I think they are the series of dots top and bottom of the device? I don't know why it makes me think of a refrigerator. This is what the original experia should look like without that ugly bezel. Dont like the very pointy corners. Is that a USB type C port? I thought Sony is abandoning the chinese market? This looks very nice especially the part where the front facing speakers are. But the sim and sd slots( i guess???) are not so good Just like the ones apple was or is using I'm not sure. Anyway those things are rubbish. This is a concept though as ther is no usb port. Hope the speaker grills will make it into production. This as fake as fake can be. Why would they post such an unprofessional picture like that. If it's from China its probably fake. I guess that is equipped with the world's first smartphone Z4 Under glass fingerprint sensor. With minimal bezels where can I put my thumbs without covering up something in landscape mode? When I watch a movie in landscape I hold the phone using one or both hands with my thumb on the front and fingers in the back. Oh no, now their Weibo account was hacked too!!!! I like it, my dream slim design phone, I want my phone to stand on its side when taking camera timer or watching movies or digital tv. And the discreet front facing speakers and less top and bottom bezel. The only missing is the Sony logo. Hopefully, they make it real.